In a recent post about a palestinian mother and child being run over @arabisouri without any evidence that the driver was Israeli and it was an act of intentional murder. 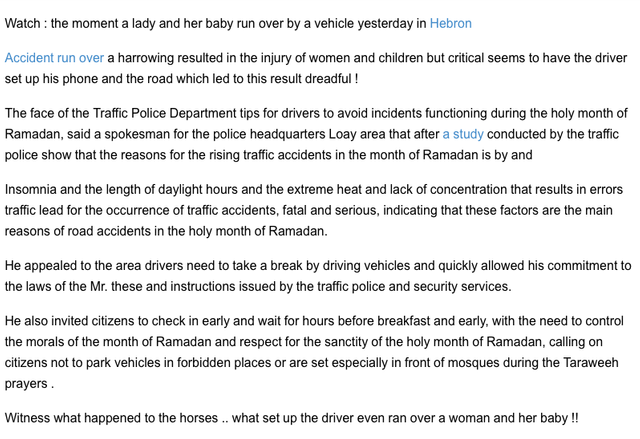 Well I agree with two things in this article running people over intentionally is evil and this women and child were Arabs from Hebron. We see that fasting during Ramadan was blamed by the original Palestinian news site. Unlike this fake news these are real stories of Arabs intentionally murdering Israelis and the corrupt and evil culture of the Arabs that glorifies these evil acts with Memorials, a pension for the families of the murderers and a song celebrating the murder of these innocents. Ibrahim Al-Akari - Hamas terrorist from East Jerusalem who deliberately ran over people at a light-rail station in Jerusalem on Nov. 5, 2014, killing Jidan Assad, 38, and Shalom Aharon Badani, 17, and injuring at least 13 others. Al-Akari was shot and killed by Israeli police officers who arrived on the scene. Here I turn @arabisouri words into truth! Until when these criminals can carry out their crimes with impunity? Not enough they were brought from all sides of world into this tiny place, stole the land from the original people after committing endless heinous massacres and then these continuous systematic crimes. Imagine if it was an Israeli driver running down an Arab or Iranian mother with her child, imagine the hysteria of the Western mainstream media and all the bigots who will attack Israel for that, let us see their faces and attack Islam over this. We condemn PLO/FATAH/PA and its crimes, condemning Arab crimes makes one human, especially when it comes from a Half-Jew like me who is a Semite, the original Semite not the fake ones who came from Turkestan or wherever and alleges they're entitled to this land based on their current religion. If you feel you've been wrongly flagged, check out @freezepeach, the flag abuse neutralizer. See the intro post for more details, or join the discord server.